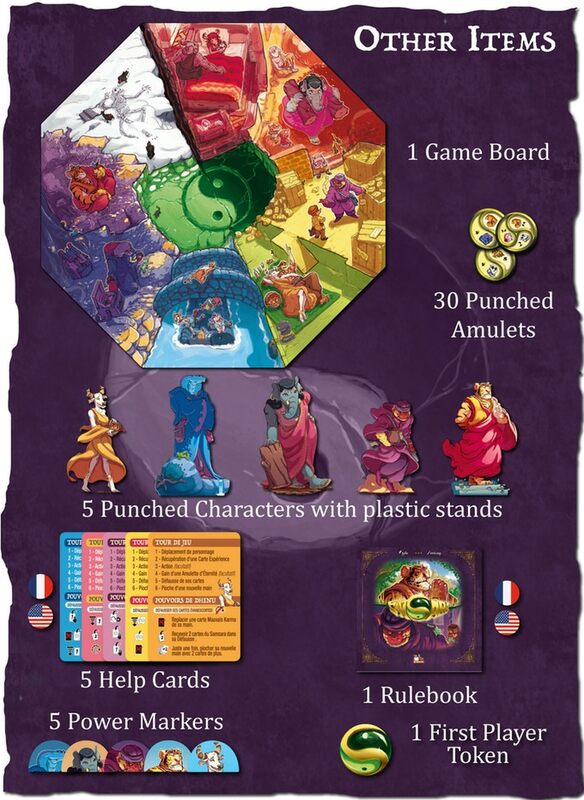 Elevate your soul to be the first to reach Nirvana and win the game! You have just reincarnated, and of course you have forgotten everything. However, you remember that you have a goal : Nirvana, and you know that your success will depend on your life choices. What will be your priority in this new life? Your relationships? Your career? Your spirituality? The cards are in your hands. 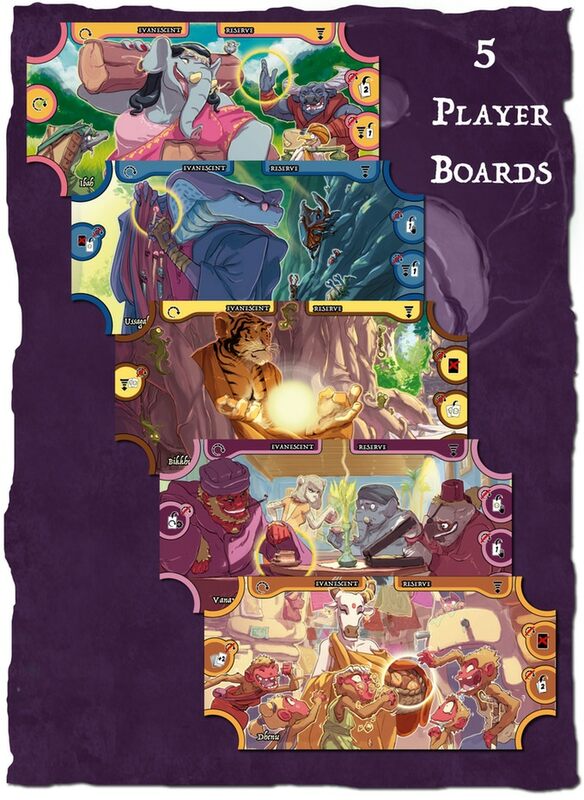 SAMSARA IS A DECK-BUILDING GAME COMBINED WITH PAWN MOVING. AVERAGE AGE : FROM 12 YEARS OLD. In a mysterious India, you give life to a tiger, an elephant, a snake, a cow or an ape. You are on a quest for the precious Amulets of Eternity, needed to reach Nirvana. 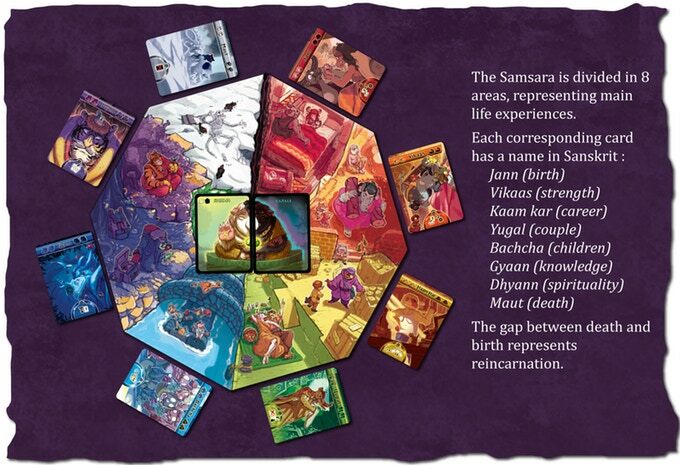 Your character moves around the Wheel of Life, also called the SAMSARA. You start the game with 8 cards in your deck (the same for all) representing your Soul, and you draw 4 cards from this deck to make your starting hand. 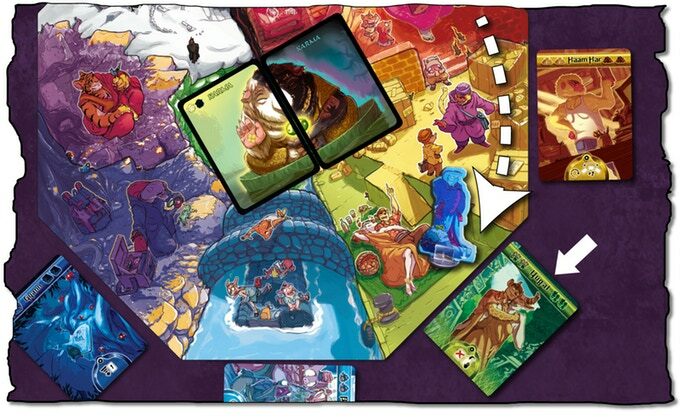 Let’s start a turn : move around the SAMSARA, to the area that you want, and add one card to your hand, drawn from the corresponding pile . 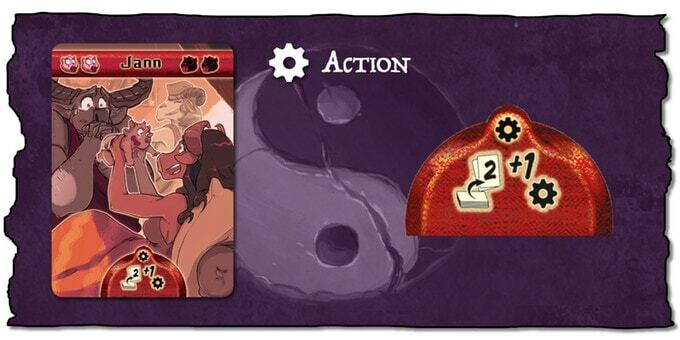 This red card allows you to draw two cards from your drawing pile and do one more action (if possible and if you wish). This means that you can increase your hand for this round thanks to this card! 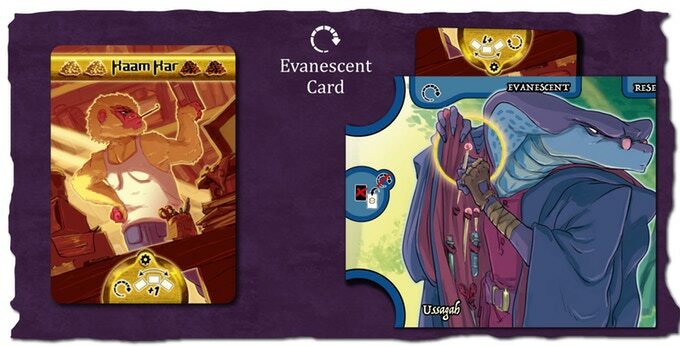 Another example : the “Kaam Kar” card, which has an “Evanescent” action. 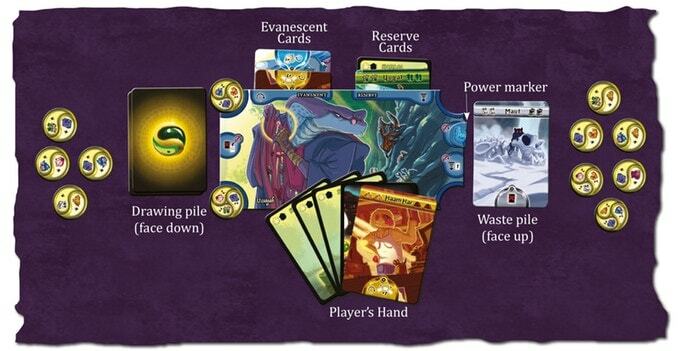 Slip Evanescent cards under the player board and their power will be active every turn. This yellow card gives you the opportunity to improve your movement and allows you to draw one card from the adjacent pile to the area you are. 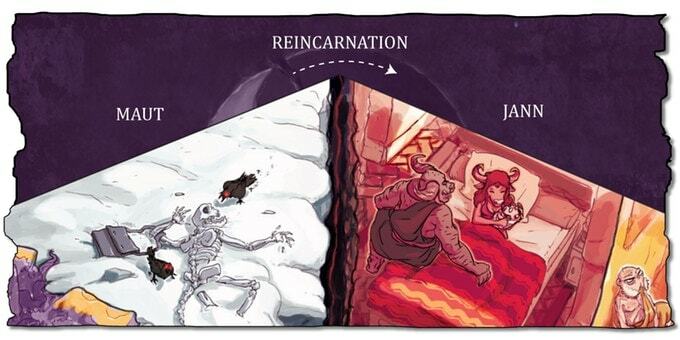 Fortunately, there are the Good Karma cards in Samsara, making your soul and your deck flow better. Theses cards will be used as jokers to gain amulets. 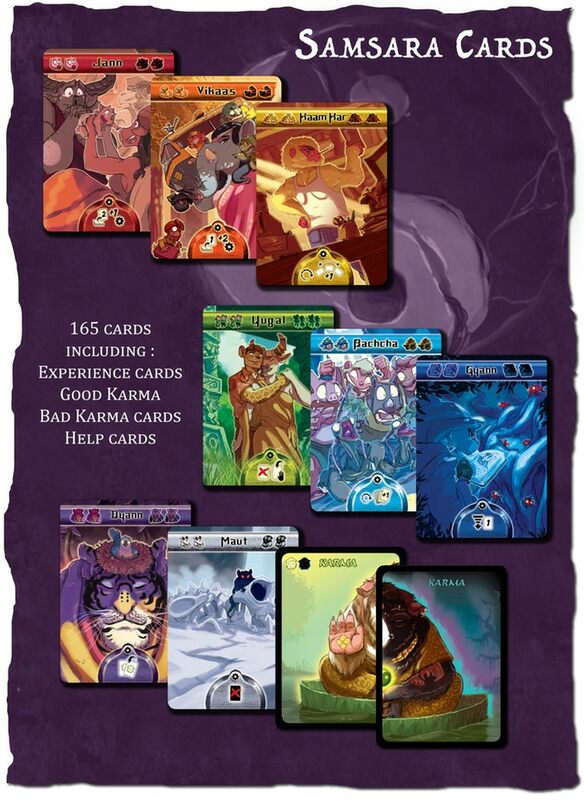 But if you use dark symbols … Bad Karma cards will be added to your discard pile, and to your deck. Your soul is soiled, the flow of your game will be compromised for lives and lives. There are other ways to get bad karma cards ! When moving on the wheel of life, if you stop in an area occupied by another player, you can either give him one of your cards, or add two bad karma cards to your hand. 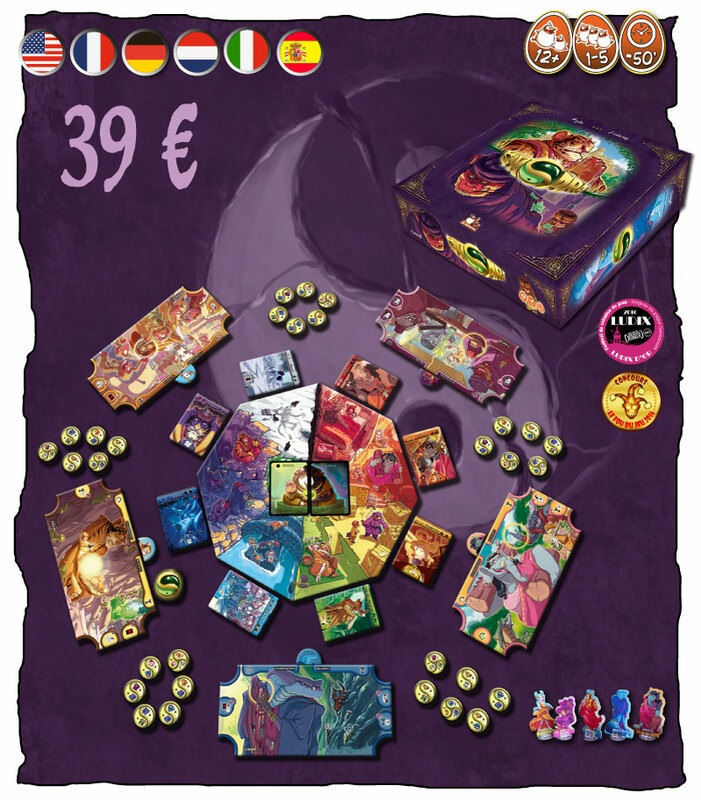 When you gain an amulet, you trigger one of your player board’s power ! 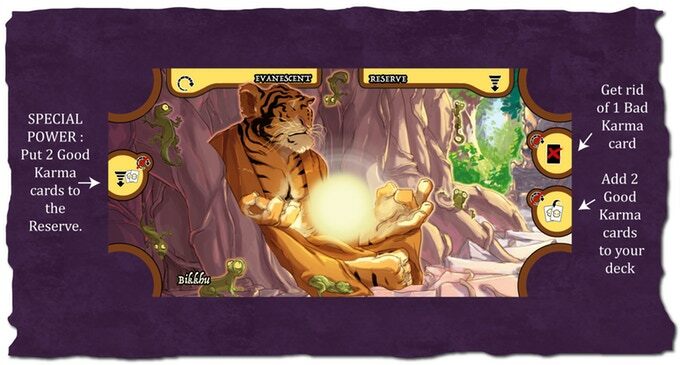 There are five characters, and each of them has developed his own powers to get his quest easier. When your turn is over, discard all your cards, played or not, to your waste pile face up (as shown below) and draw a new hand of 4 cards, from your drawing pile, for your next turn. The first one who gets his fifth Amulet of Eternity opens the doors of the Nirvana! Congratulations! 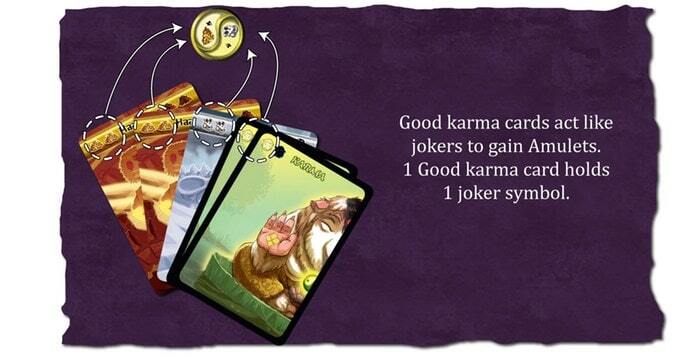 If other players get there in the same round, the one with the least bad Karma cards in his deck wins! Discover our characters, one’s more lively than the next. Each one has his own story, his own path. Enjoy Nicolas Sauge’s breathtaking artworks! Like most elephants, Ibah has an exceptional force. She can lift tree trunks as large as her and keep her feminine grace! Her sense of duty and her legendary memory gives her great advantages in her quest. 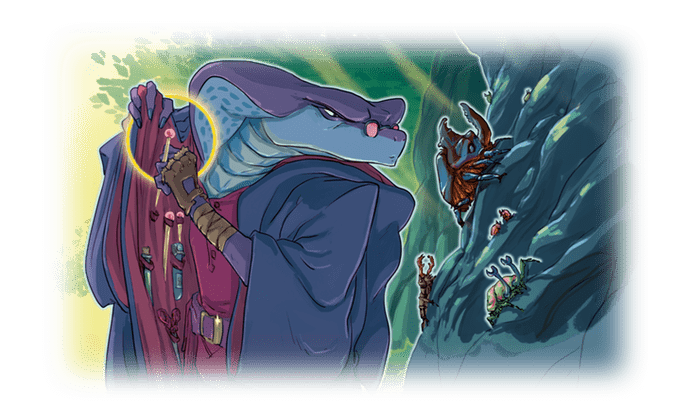 Ussagah, the cobra, has chosen the path of knowledge. Study, research and classification, these are tools to search for the precious amulets. Versed in alchemy, he also manages to transmute the bad karma into good karma. 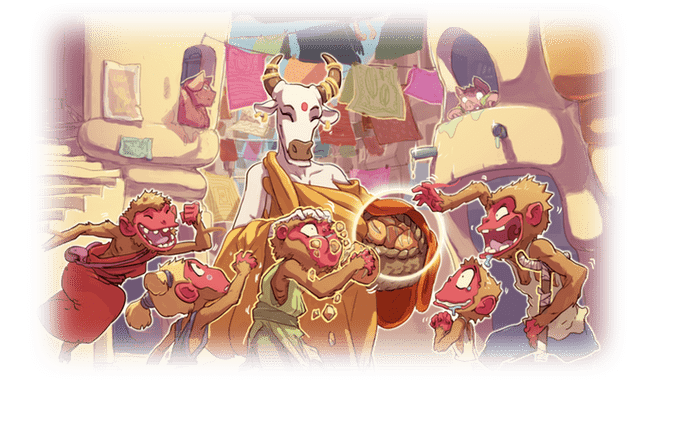 Dhenu, the holy cow, doesn’t have children of her own. Yet, all the beggars of the street would like her to be their mom. Loving and gentle, she naturally spreads joy around her, knowing that everything she gives will come back to her eventually. 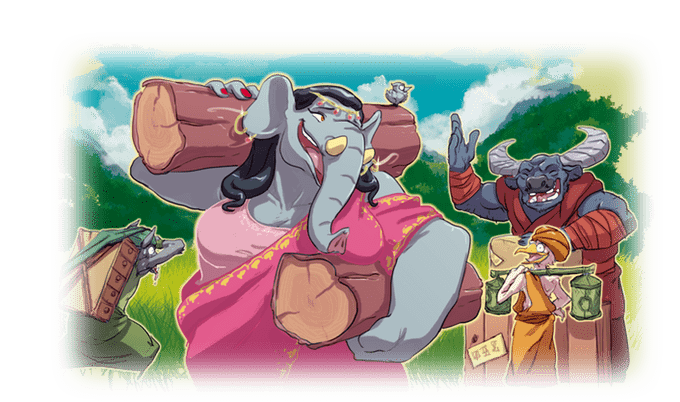 NICOLAS SAUGE : Illustrator of Néron and Golam comics, Nicolas Sauge embarked on this gaming adventure inspired by the good karma of Samsara. His artistic appropriation and personnalisation of this universe are reflected in his vibrant illustrations which are undeniably the soul of Samsara.